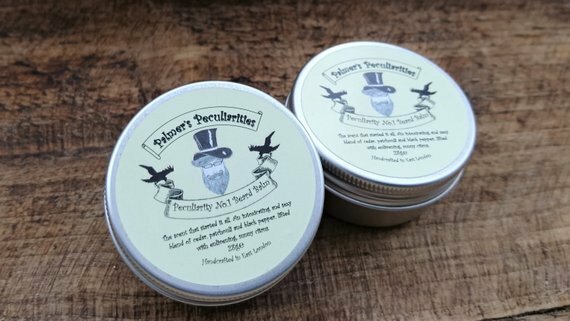 The Palmer’s Peculiarities Peculiarity No.1 Beard Balm is a vegan friendly beard care product, but don’t let that put you off if like me you enjoy a bacon sandwich! The Palmer’s Peculiarities beard care products are hand-made in small batches in East London by owner and creator Alison Palmer, hence the name. I have previously tested the ‘Bohemian‘ beard balm and had said that it was grainy and the Peculiarity No.1 balm is unfortunately the same. It is a very fine grainy like feel, that feels like there is some sand in the balm (there isn’t). Alison has said that she is working on a new recipe to try to correct this. Now normally this would be just a case of having to work the balm for longer in your hand to melt it, but the grain is so fine that you end up working the balm into your skin and the grainy texture is still there. So it is a case of having to accept that and just apply the balm as is and so running thumb and finger through the balm results in picking up these pieces! The base for the balm is Shea Butter, Jojoba Oil, Grapeseed Oil, Candelilla Wax, Cocoa Butter, Vitamin E and the result is a medium consistency balm that has despite the issues, it left my beard feeling and looking good. If the grainy texture is sorted this will be a cracking balm. The scent of Peculiarity No.1 is a blend of Bergamot, Patchouli, Cedar, Black Pepper, Lime & Tea Tree essential oils and this has created a woodsy, earthy scent and the warmth of the black pepper just comes through and there is also a slight freshness about it. It is a lovely scent blend, blended perfectly and a definitely a scent to try! I am afraid to say that if you do not like Tea Tree or you have a reaction to it, well then Palmer’s Peculiarities is not for you as Tea Tree is used throughout the range, even in the Naked products. Priced at £12.99 for a 30ml tin of balm, the Palmers Peculiarities Peculiarity No.1 Beard Balm is quite pricey.